He was reserved by someone that never showed up for him. A volunteer writes: Tully is in the quarantine kennel for some reason and he is going to need your help to make it out. Please SHARE for his life, he's SO precious and a FOSTER or ADOPTER would save him. Tully is the best! He's super cute and just a little ball of fun! This fella has his whole life ahead of him and he's hoping he doesn't have to spend much more of his puppy days in these kennels. Tully is about 2 lbs and is only 2 months old. 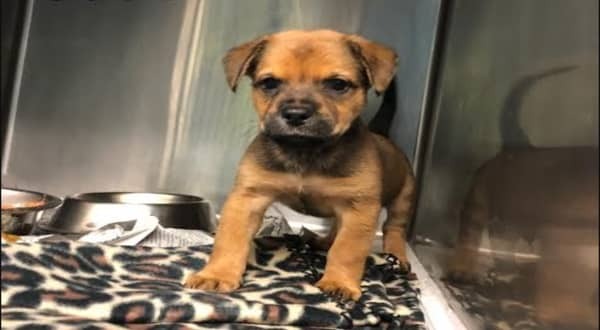 Fidonation, if you or someone you know is interested in giving this pup the forever family he rightfully deserves, please contact the San Antonio Animal Care Services, and reference the shelter ID #A500471. 5 Responses to "Terrified 2 months old baby Tully is back on the 'back room', His angel never came for him"
Please help me for this little sweetheart! Rescues, fosters, adopting families come see little Tully! He needs a loving family of his own. Please help! Can you give a link to the other thread so we can see if he is safe? Tully has been adopted. He is OUT OF THE BUILDING!